Based on the new Peter Rabbit animated TV series. Peter and Lily need to escape Mr Tod, but will they pass the squirrel test to be allowed up in the trees? Each Read it yourself book is very carefully written to include many key,high-frequency words that are vital for learning to read, as well as a limited number of story words that are introduced and practised throughout. Simple sentences and frequently repeated words help to build the confidence of beginner readers and the four different levels of books support children all the way from very first reading practice through to independent, fluent reading. 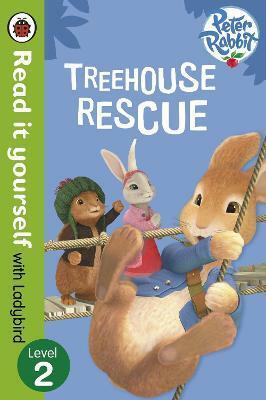 Peter Rabbit: Treehouse Rescue is a Level 2 Read it yourself book, ideal for children who have received some initial reading instruction and can read short, simple sentences with help.